Haryana Chief Minister Manohar Lal Khattar on Sunday held talks with the agitating Jat leaders from the state on the quota issue ahead of their planned march to Parliament in the national capital, where massive security arrangements have been made by authorities. Before meeting Khattar in New Delhi, All India Jat Aarakshan Sangharsh Samiti (AIJASS) Chaiperson Yashpal Malik said that their protest will be peaceful and they will decide their next course of action after the talks. “The protests will be peaceful. For 50 days our protests were peaceful. We have made seven demands and we are here to meet the CM and others with a positive frame of mind. “We believe that talks will provide solution to the issues... but we will decide our future course of action based on the outcome of the meeting,” Malik told reporters in New Dellhi. “If we reach agreement on all issues, I will inform you,” he said on whether they will suspend the agitation. Malik was accompanied by a group of 60-70 representatives of various khaps (sub-sects) of the Jat community. 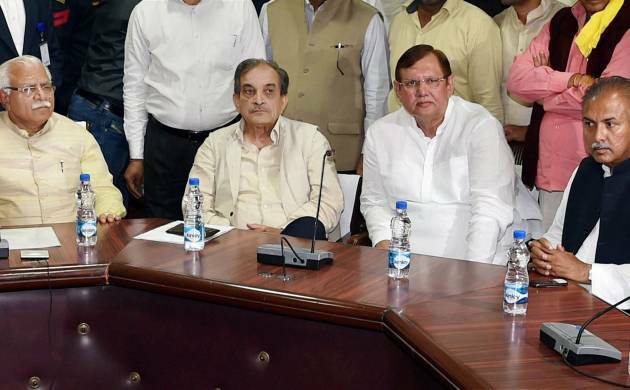 Besides Khattar, Union Cabinet Minister Birender Singh was among those present in the meeting. In view of the planned march on Monday, prohibitory orders have been clamped in Delhi, Haryana, Uttar Pradesh and Rajasthan to stop Jat protesters from entering Delhi and about 24,700 paramilitary personnel have been mobilies to maintain peace. Metro and road transport has been curtailed and several schools have been closed in the national capital. Metro trains will not travel beyond the city’s borders from 11.30 PM while 12 stations in Central Delhi will be shut from 8 PM till further orders. Roads like Kamal Ataturk Marg, Safdarjung Road, Kautilya Marg, Kautilaya T Point Near Bihar Bhawan, route from Teen Murti to Gole Methi roundabout and Zakir Hussain Road for commuters coming from Nizamuddin to India Gate will be closed from 8 PM onwards on Sunday. In an advisory, the Union Home Ministry has said that protesters should be arrested or detained much before they enter Delhi. It also called for disallowing movement of buses carrying the protesters on highways and banning tractor trolley movement. Internet services have been suspended in many ‘sensitive’ districts of Haryana including in Rohtak, Jhajjar and Sonepat. Haryana DGP K P Singh has said that all highways and other roads passing through the state are open and all security measures have been taken.Earlier speaking to reporters, Khattar had said that the state government is committed to resolve the issue. Besides quota, the Jats have been demanding release of people jailed during last year’s agitation, withdrawal of cases slapped during the protest and government jobs for the kin of those killed and injured while taking part in the stir. A Haryana ministerial panel led by senior Minister Ram Bilas Sharma had held talks with the Jats in Panipat on March 16, after which the Minister had said that an agreement had been reached with the Jat community and the deadlock could end soon. Around 30 people were killed and more than 300 people injured when a similar agitation by the Jats had resulted in large-scale violence in Haryana in February last year.